Gangsters in suits, sultry temptresses putting on nylon stockings (and let me tell you, boys, Thelma White had great gams! ), the use of the words "kid", "gee" and "swell", a pedestrian getting creamed in a crosswalk accident, self defenestration, the age-old argument of freedom and enterprise vs. societal outcomes and norms. Why this movie never received a single Academy Award nomination is simply beyond me. Yesterday we lost my mum, it was in the end a relief, her body fought on after her mind had gone. These are two things I wrote, a small obit and something I wrote not long ago about dementia. It was likely a brief moment of lucidity we figured, she tried not to breathe. The hospital had called and said she'd taken a turn for the worse, she'd stopped breathing for two minutes. It wasn't the first time they'd called. Dementia is a slow ebb, it leaches out the soul and the spirit and leaves the carriage, aimless, rudderless. It turns the grieving process into a chromatograph, stretched over years. When my father died and I was asked if I wanted to view his body I declined, the part I knew, the part I'd had a relationship with was gone. And so it is with my mum, it's her sinewy body that swam until not long ago, her bandy legs, her crooked but steady hands, but not her wise unshakable untiring good, not her clever understated humor, not her patient and loving motherness. After what could be hundreds of little bleeds, strokes, TIA's they call them my mothers brain is riddled with holes, shot away. But unlike Bonnie and Clyde's car unbelievably, inexplicably, impossibly, it still contains life. We can only guess, but we're pretty sure that if she had her wits, she'd be gone, but the incredible strength that we always suspected she had won't let go, it won't let her go. In our own ways we each assure her that "everything is taken care of, we've got it all sorted out" in the hope that her urge to watch over and protect us will be satisfied and she will die. It's the hardest thing to say, we want her to die. At about 4am this morning Fairlie Marie Stewart nèe Stubbs died in Tatura. 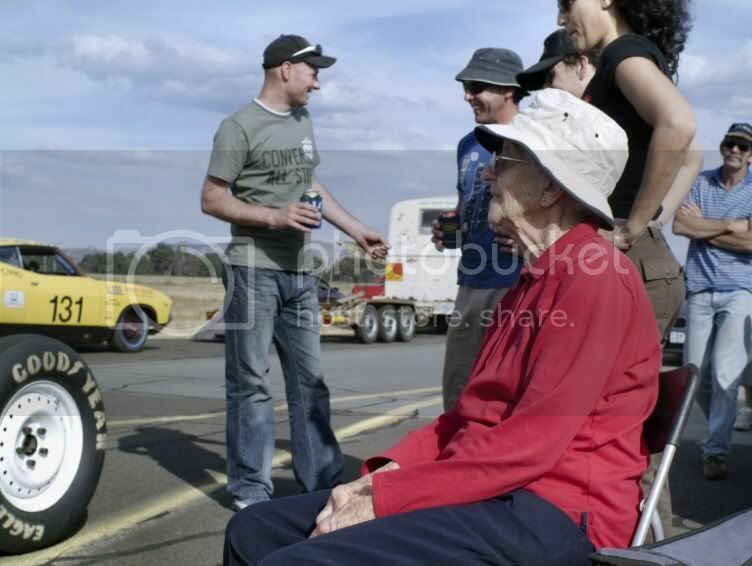 Born in Shepparton in 1927 she married James Burt Stewart who she met at Shepparton High School, in 1950. Mother to Catherine Fairlie, John Galloway, Mary Primrose, Ruth Alison and James Lachlan she was the youngest of three after John and Myrrdin. She was Gran to Nirri Tomas William Hamish Duncan Alice José Grace Bede Ignatius Lachie and Cecilia. She could run and swim or beat you at tennis and scrabble, she was selfless, funny and clever, conservative but fearless. A country girl, a nurse, a mother and friend to many more. We all loved her very dearly. Oh, James. May she rest in peace. And may you and he rest of your family remember her with love forever. Nancy and I send our best wishes and happy thoughts to you to help you move to a life without your mum. James, You will always remember her for the person she was. It can be hard at the end. Stay strong, and take care. Those were wonderful words, thank you for sharing. Sincere condolences for your loss. Sincere condolences for your loss James. May your mum rest in peace. Ageing is harsh, harsher still when dementia is part of the process. Your words capture the emotions that many others are forced to share, the same experience at the ending of the life of a vital, caring human being. May you find the strength to celebrate her life, and to heal yourself . . . . . . .
How proud your mom must be of your way with words-- to be able to convey, thoughts that make us reflect on our moms and our journey to the end with them ---that misted our eyes ---as I am sure yours must have in writing about yours. Now , be nice everyone because although she's 80 she's an SMSaholic and she watches this site as well ( Hi Mum)...there was one revealing moment when we were watching some footage that my cousin shot on the Rev's big vid cam...he was in my mum's car and after I'd pulled over because of the fume-out I could hear her on the tape saying " ...and he doesn't need that with his lungs..." god love her She's always expressed disappointment that I dropped out of university to play rock and roll but this bellytank thing has been a Phd in life and I think she "gets it". She's real proud of the tank and was rambling about what it'll do at the salt, eyeing-off the large bag of Mexican Chilly corn chips I was holding. Devouring them like a school kid who's not allowed to have sweets - the coughing started - face red as a new Chev block, the orange foam ear plugs popped out like Champers corks, and she was leaning forward - arms waving in the air - fists clenching handfuls of CC's. Thank Christ Goggle's sister and the other girls were there to administer resuscitation. I was glared at - tried and found guilty - slinking away, leaving the evidence on the picnic table. Later, sitting with Club Animal in his jocks (whisky-cola mixer in hand), we watched the tank bounce along the runway. Animal let fly a commentary on each run that would make a Digger blush. She'd nod or frown in response, taking it in her stride. "That sheila's tough as a girder-bender" my old Pops would've said in compliment. Sorry about feeding Chilly Chips to your Mum. I'm sorry to hear that, James. My condolences.